These M&M cookies are soft, chewy, thick, and absolutely delicious! These classic cookies are made with simple ingredients in the perfect combination that makes the M&M cookies bake up thick and chewy every time. 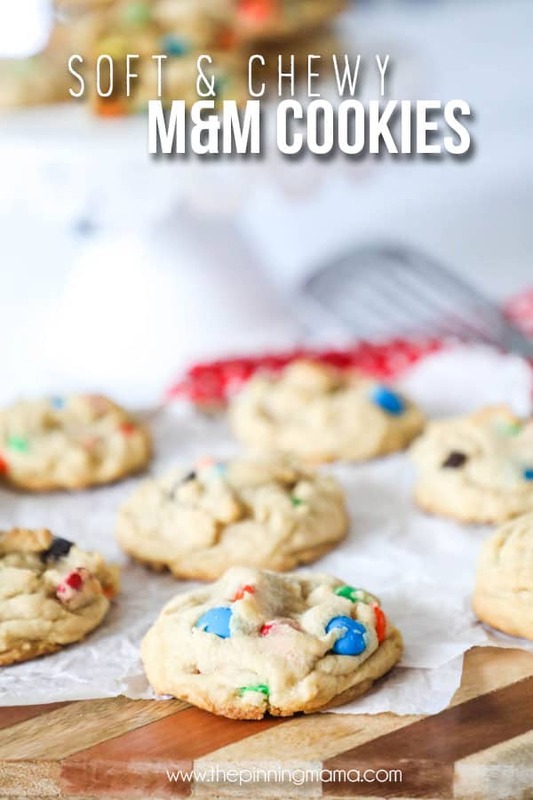 Perfect for dunking in milk, packing in lunches, baking for the holidays, or having a treat any day, this soft chewy M&M cookie recipe won’t disappoint! Do you ever wonder why some cookies bake up nice and thick and chewy and other cookies spread while baking and end up thin and crispy? It all has to to with the ingredients, the amount of them, and how they are baked. 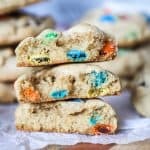 This M&M cookie recipe doesn’t have any super secret ingredients and uses common pantry items but by combining just the right amount, in just the right way, and baking them just the right time, the result is that coveted soft, thick, chewy M&M cookie. Follow along as I walk you through some of the common questions and exactly what we do to get what I think is the perfect cookie recipe! A high ratio of dark brown sugar– Since brown sugar has more moisture than white sugar it is an important ingredient in making the cookie soft and chewy. Using dark brown sugar has a higher molasses content and will keep them even softer! A non-sticky dough– Using more flour (then making sure to up the flavor with the other ingredients) helps the dough to hold its shape much better allowing the center to be thicker and softer than a cookie that thins and spreads as it bakes. The perfect cook time– You really have to be careful not to overbake cookies, especially these cookies! If you want a super soft, chewy cookie, you will remove them when they are almost done. The cookies continue to bake as they cool and end up with the perfect soft chewy texture in the end. Since we ended that last note on the importance of bake time, let’s dive into it a little bit more. Baking time can be tricky since each oven will cook differently based on size, whether it is electric or gas, the type of oven and heating element, the size of the cookies, and the climate you live in. All of these things will play into how long to cook your M&M Cookies. This recipe calls for 9-11 minutes of baking time for a cookie that is about 1.5-2 tablespoons big. I like to set my timer for the low end of the baking time and then remove them if done, or monitor them over the next minute or so until they are perfect. Cookies will have a sheen when they are raw and as they bake they will start to lose it. I like to watch for the sheen to be gone, or just left in the middle for the right time to remove the cookies. This recipe is simple! Just gather the ingredients and get to cooking! This is an overview of how this recipe comes together. Make sure and scroll to the bottom for the full recipe card. Cream the butter and sugars. Add eggs, one at a time, then mix in the vanilla. I like to use my electric mixer for this, but you can do it by hand if you want to work on your muscles. In a separate bowl, sift together the flour, cornstarch baking soda and salt. Add the dry ingredients to the wet ingredients in small batches, mixing in between additions. Dough should not be sticky or crumbly. If the dough is sticky, add in flour 1 tbsp at a time until it it is not sticky. If the dough is crumbly, add in water 1 tsp at a time until it holds together and does not crumble. Once it is combined, add the M&M’s and stir them in by hand until evenly distributed. Drop by heaping rounded tablespoonfuls on an ungreased cookie sheet. Bake for 9-11 minutes or until the center is just set. Cool for 2 minutes then transfer to a wire cooling rack. These M&M cookies are pure perfection when they are warm and gooey fresh out of the oven. But after even a couple of hours they start to lose that amazing soft and chewy texture. There are a couple of tricks I use to keep them just as good, not matter if you eat them in an hour, a day, or a week! Freeze your M&M cookies! Cookies can be frozen before or after baking (see directions below). Freezing cookies helps retain almost all of the moisture in the cookies so it is the best way to keep cookies soft and chewy when ever you want them for up to a month. My preferred method is freezing the cookies after they have been baked. Store Cookies with a slice of bread. If you don’t have the option to freeze the cookies, placing a slice of bread in the container with the cookies will help keep the cookies soft and chewy. I like to set it on top of a piece of parchment or in an open bag inside an air tight container with the cookies. If the bread touches the cookies directly it can result in soggy spots. Cookies freeze beautifully and freezing them is a great way to keep them tasting fresh no matter when you get the craving! You can freeze these M&M cookies both before and after baking. Make recipe as directed. Portion cookies out into rounded tablespoonfuls and then place in a single layer in a zip top bag or air tight container. When ready to bake, remove from freezer and place on a baking sheet frozen. Bake as directed adding about 2 minutes to the baking time to account for being frozen. Bake as directed and allow the cookies to cool completely. Place cookies in zip top bags or an air tight container in the freezer. When ready to eat, remove one or more cookies from the freezer and allow to stand at room temperature for 5-10 minutes or microwave for 30-45 seconds. These M&M cookies are soft, chewy, thick, and absolutely delicious! These classic cookies are made with simple ingredients in the perfect combination that makes the M&M cookies bake up thick and chewy every time. Perfect for dunking in milk, packing in lunches, baking for the holidays, or having a treat any day, this soft chewy M&M cookie recipe won't disappoint! Cream the butter and sugars together. Add one egg at a time, mixing in between. Then stir in vanilla to combine. In a separate bowl, combine the dry ingredients. Mix the dry ingredients into the wet ingredients in thirds mixing between each addition until they are combined. Mix the M&M candies in by hand until they are evenly distributed. Scoop heaping rounded tablespoonfuls onto an ungreased cookie sheet, evenly spaced, about 2" apart. Bake at 350˚F for 9-11 minutes or until the center of the cookie is just set. Let cool on cookie sheet for 2 minutes then transfer to a wire cooking rack. Dough should not be sticky or crumbly. If the dough is sticky, add in flour 1 tbsp at a time until it it is not sticky. If the dough is crumbly, add in water 1 tsp at a time until it holds together and does not crumble. Cookies should be either baked or frozen immediately. Cookie dough should not be stored in the refrigerator as the dye from the candy will dissolve and spread. For more great easy recipe inspiration, sign up for our emails here!